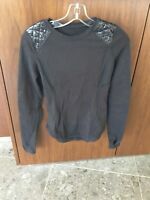 LULULEMON Zip Jacket Ruched Neck Big Logo Sz 2 RARE! LULULEMON SWIFTLY TECH TWO -TONE CREW GREY FLORAL LACE SIZE 2 RARE!!!!!!! luckymoney2012 has no other items for sale.